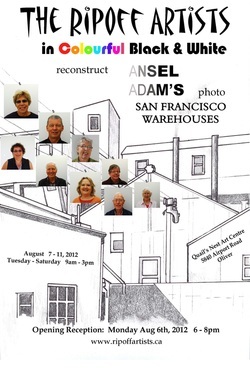 In the heat of the August summer, the RipOff Artists take the shutters off as they focus in on the black and white photograph of Ansel Adams’ ‘San Francisco Buildings’. His passion about the wilderness and the environment found expression through his calling in photography. Adams once stated, "a true photograph need not be explained, nor can it be contained in words". Known as a man of the West, his images, the icons of "wild America", are legendary. Not everything is black and white with this year’s RipOff endeavour. To make the challenge even more, well, challenging, each of the nine artists working in their own medium will introduce some form of colour. Newcomers and followers of the past five RipOff exhibits will appreciate the remarkable transformations of a recognizable artist’s work through new approaches. With each RipOff executing a different medium, the depth of field of talents produces a striking show. The artists happily converse with interested on-lookers as they work on their interpretations. In alphabetic order this year’s artists are: Enid Baker - quilting/acrylic painting; Thea Haubrich - encaustic; Kurt Hutterli - 3D installations; Terry Irvine - felting and knitting; Barbara Levant - weaving; Leo Pedersen - wood working; Marion Trimble - collage; JoAnn Turner - painting on non-traditional surfaces; and Russell Work - photography. The aim of the week long show is to highlight, study and pay homage to Ansel Adams by throwing open the workshop doors and inviting the public to view the artists in action. The exploits start Monday, Aug. 6 with a reception from 6 - 8 pm. From Tuesday to Saturday, the artists can be found exposed in the shadows of the Quail’s Nest, from 9 am to 3 pm each day. Our goal is to have our pieces completed when the aperture closes 3 pm sharp on Saturday, August 11. Come check us out at the Quail’s Nest Arts Centre at 5840 Airport Street in Oliver, B.C.